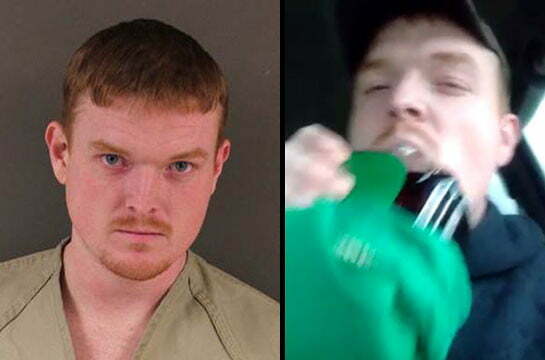 Possibly attempting to set a new distracted driving record, 28-year-old Dustin Rittgers of Ohio was arrested recently after he posted a video of himself drinking alcohol while driving his car. According to the authorities, Rittgers recorded a 12-second video filming himself while taking a drink from a partially covered bottle of alcohol. The camera pans around to show Rittgers controlling the moving vehicle with a single finger on the steering wheel. Rittgers responds with “I am a good driver don’t worry…I gots one finger on the steering facebooking and it’s raining smh I am good. I am a pro.” After the video went live on his Facebook page, an anonymous source called in a tip about the video to the local authorities. When the Franklin County sheriff’s office was alerted about the video, police were sent out to locate Rittgers south of Columbus, Ohio in Hamilton Township. Police officers located Rittgers, pulled over the vehicle and placed him under arrest. Rittgers racked up five misdemeanor charges, some of which included operating a vehicle impaired (OVI), following too closely and open container in a motor vehicle. Rittgers has plead not guilty to the charges. However, this isn’t the first time that Rittgers has been stopped for driving while impaired. Earlier this year, Rittgers plead guilty in a similar case after being stopped by state troopers during September 2014.